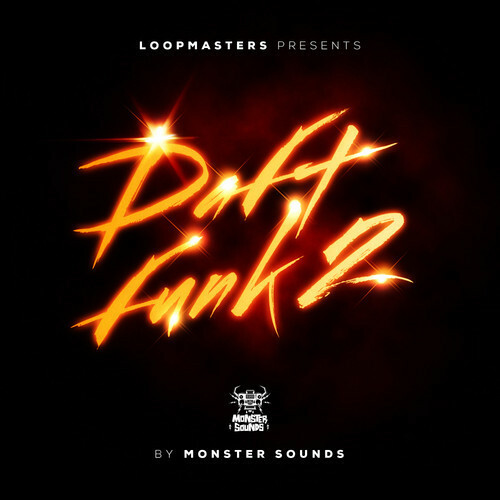 Funked Up and ready drop into your tracks, Monster Sounds bring you the much anticipated follow to our best selling Daft Funk release. Deep from thevault, these lovingly crafted riffs, loops, beats and samples are all Busting with the distinctive head nodding funk that we all know and love as the soulful sound of French electronica. Some of the most iconic dance music of the last 20 years has come from the shores of France which created the original filtered electro sound, which bases the tracks around a straight four to the floor groove with a heavy disco funk and soul influence, but bringing a contemporary electronic sound into the mix with electronic production, techniques and sounds. Many of these popular releases have relied on sampling the main groove or elements from rare records to capture the live feel and vibes from the original 70s and 80s grooves' which is a risky business and can lead to long legal battles if the sample is not cleared - with Daft Funk 2 you can avoid these hassles and get straight to the funk. Following on from Part 1 we have kept loosely to the formula and have thrown down a whole new set of huge grooves, from beats to bass lines, keys and funky guitar licks that Niles himself would be proud of, also digging out a few rare synths from our collection to add something special to this collection. The concept behind Mixing the full grooves together is to then give you the chance to filter and mash them up as if you were sampling from a record which is the key to capturing the vibey sound of sampling vinyl, as the way your filters react to the full loops is much more interesting and authentic if all the instruments including the drums are playing together. To give you full flexibility we have given many of the grooves split down in to different parts to allow you to work in more detail if needed. Drum wise we have given you a mixture of live drum loops for the funk and disco, but also some thumping house beats and tops to get the floor shaking and some more interesting quirky top loop and groove ideas. In the Bass department, continuing the theme of part 1 we have a great selection of live funk bass riffs, all recorded on a lovely vintage '72 fender p bass, some are straight and some treated with vibey fx. To complement these we have included a bunch of electro synth bass riffs and parts to get the floor bumping on a more heavy tip. Fresh for part 2 we went a little "off piste" and dug in the Monster Sounds loft for our rare "Siel Orchestra " Analogue synth. For those who don't know Siel was bought out by ARP and later it became the ARP Quartet. We ran a whole heap of super warm and Analogue parts off and also some awesome multi samples of this rare and difficult to handle beast, giving you the fun of the analogue without the expense and the tuning problems. For the riff writers and control freaks there's plenty of synth and bass Multi samples to craft your own parts. Also for the Complextro crew a great collection of one shot music stabs and guitar chords perfect for accenting your riffs to get that complextro mash up sound. Rounding off the instruments we finish up with more funky guitar riffs put down by a top UK funk guitarist. Finally there are the FX,with plenty of hits and the inclusion of the always useful build whooshes to make the euphoric builds and drops. In Detail expect to find 82 Live Bass Funk Loops, 45 Synth Bass Loops, 92 Full Drum Loops, 41 Kick Loops, 64 Top Loops, 68 Filter Loops, 34 Groove Loops, 26 Guitar Loops, 154 Pad and Riff Music Loops, 48 FX, 11 Bass Multis (110 total), 15 Synth Multis (146 total), 93 Music Stabs, 10 Clap Hits, 20 Kick Hits, 26 Hat Hits, 20 Snare Hits, 11 Perc Hits, 609 Rex2 Loops, 135 Soft Sampler Patches for NNXT, Halion, SFZ, Kontakt and EXS24 totaling 1.39GB in pristine 24 Bit Quality. Monster Sounds are really proud to bring you a pack which we feel captures the essence of this exciting sound that has become a worldwide phenomenon for good reason, due to its simple use of infectious grooves . We believe this pack will give you the building blocks to set you on your journey to produce some floor filling tunes. Monster Sounds Daft Funk 2 MULTiFORMAT-MAGNETRiXX Fast Download via Rapidshare Hotfile Fileserve Filesonic Megaupload, Monster Sounds Daft Funk 2 MULTiFORMAT-MAGNETRiXX Torrents and Emule Download or anything related.